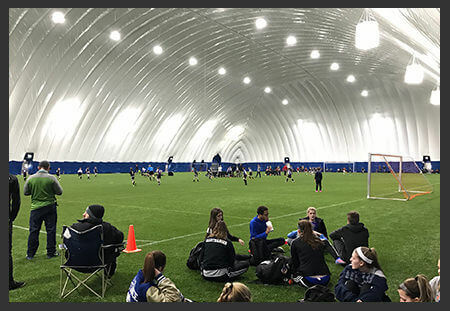 The Soccer Centre Dome Rossford facility is over 94,000sq ft and boasts an enormous turf field. Our field can be divided to support a full 11v11 field, two 9v9 fields, or four 7v7 fields. We also have a 75yrd by 21yrd training space available for rental. 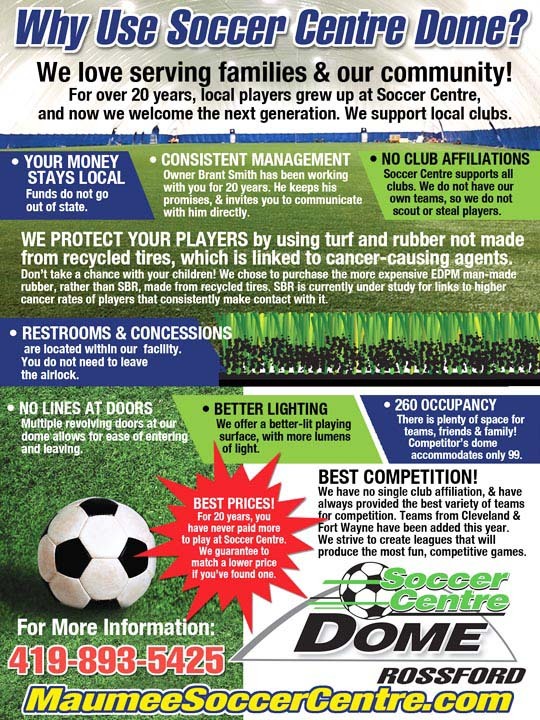 Our facility is equipped with restrooms, drinking fountains, a concessions trailer, and a wide assortment of soccer equipment. During the 2017 Season we added full length batting cages complete with "L" screens to meet all of your baseball and softball needs. Finally, we have recently partnered with Athlete HQ which offers a wide assortment of sports training and personal training sessions. Field Rentals and advertising opportunities are available.